Community Finale Spoilers: What’s Going to Happen to Pierce? Some details about the finale have arisen, revealing whether or not Pierce’s departure will be addressed. 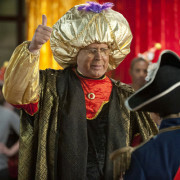 Chevy Chase has quit Community, and Derek B. Gayle shares some thoughts on what it could mean. Season 4 of Community will premiere on February 7. Derek B. Gayle reviews the third and final installment of Community’s three-episode finale from May 17.